Following the general elections in October 2018, the process of government formation at the country level and in the Federation of Bosnia and Herzegovina is lengthy. 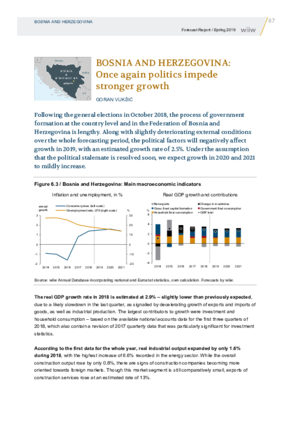 Along with slightly deteriorating external conditions over the whole forecasting period, the political factors will negatively affect growth in 2019, with an estimated growth rate of 2.5%. Under the assumption that the political stalemate is resolved soon, we expect growth in 2020 and 2021 to mildly increase.